Fully lined. Size 14 16. Made from - 100% Wool. Vintage 70s skirt Jaeger A-line wool blend light brown check skirt 10 W25"
The skirt has a slim waistband and fastens at the side with a zip and hooks. The skirt has a semi-full A-line shape so that it flares out to midi length and the checks are matched at the front seam. Consists of two actual layers - a yellow under skirt with the orange wrap top skirt tying at the front. Two front patch pockets. Footwear is always sent in a box. A fab genuine vintage skirt by Jaeger London. With an unusual blue and white geometric pattern, this is really fun to wear but sadly does not fit me now. Fully lined and in excellent vintage condition. Fastened with a zip and two hooks and eyes at the back. This is a well made, high quality item. From a smoke and pet free home. Washed and ready to wear. Any questions, please ask. Retro 1980s 90s. Labelled sz 12 Looks sz 10. Grey black white dark goldy yellow checks. Soft pleats, full skirt. Lined, side 3 button fastening. In fab used condition, no holes in the fabric or lining. Closure by a concealed side zip and button, deep pockets on both sides. 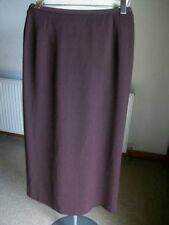 Jaeger Skirt Vintage 1970's Fine Wool /Cotton Full Skirt Size 8/10 Neutral Tones. Condition is Used. Dispatched with Royal Mail 1st Class. This is a fabulous classic vintage piece from Jaeger it is a very fine wool/cotton blend the skirt is very full and swirly and has pewter buttons down the side fastening and also a side pocket. The skirt is unlined. 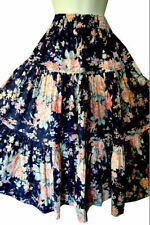 The waist measures 25 inches so would be perfect for a size 8 or small 10. I can't quite do it up on my size 10 to 12 model as you can see in the photographs. I also have the matching shirt/blouse for sale in a separate listing. 29" waist to hem. 100% Polyester … with satin look lining … also 100% polyester …. I promise to try my best to resolve any problems. Made In Great Britain. Super cute 1970s pure wool A-line skirt by Jaeger. Zips to fasten. Fully lined in orange acetate. NAVY PLEAT WOOL POLYESTER MIX SKIRT WITH SIDE BUTTON FASTENING AND FIXED WAIST. 55% POLYESTER 45% WOOL - LINED IN VISCOSE. Vintage JAEGER Boucle Wool Skirt Vintage Size 14 / Modern Size 10 Waist: 28 inches Length: 39 inches Fully Lined Colourful mixed countryside colours Long A-line Centre Back zip fastening with hook and eyes Has belt loops for a belt Has side pockets Looks like it has been dry cleaned recently because of the dry cleaning tag! In Great Condition, I can't see any faults! If you have any questions please ask! 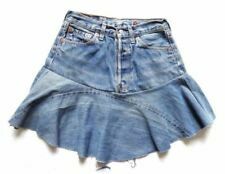 Vintage Jaeger skirt size 12 modern 8 Very good condition. Black full length (37"). Fixed wrap over with draped ruffle edge. Two vertical front pockets and fully lined, just the right colours and shape for autumn! A beautiful pencil skirt from Jaeger London. Cream wool/cotton mix is accentuated by a silver threading that creates a pinstripe allover this piece. Skirt - Waist 13" | Hip 17"| Full Length 26". Any defects will be identified. Original Vintage JAEGAR Black Velvet Midi Length Skirt UK10. Condition is Used. Dispatched with Royal Mail 1st Class. This is a gorgeous black velvet midi length skirt by classic British designer label, Jaeger. It is made from 100% cotton velvet and it a very fitted size. Even though the label size says it’s a UK12, as it is a vintage piece, it is more like a UK10, as the mannequin the skirt was shot on, is that size. It is fully lined (100% Triacetate) and fastens on the side with a zip, interval clasp and black button. It will look fab when worn with a t-shirt and kitten heels. It’s a real wardrobe investment. Dark blue faintly ribbed wool blend, with a toning silky lining inside apart from a 11cm wide panel down the centre rear from waistband to hem. Side zipper with buttoned fabric cover inside. Gathered under the waistband at the front, 18cm rear hem slit. A gorgeous candy pink skirt from Jaeger made from Angora and Wool. Skirt - Waist 14" | Hip 18.5"| Full Length 24". Any defects will be identified. Important Notes. Very dark blue cotton blend finely ribbed grosgrain, with a toning lining. Side zipper which is concealed by a fabric flap and two hooks and eyes at the waistband. 15.5cm central rear hem slit. Dry clean. The fabric is 50% wool, 40% viscose and 10% silk with a viscose lining. Lovely quality. Waist: 32" snug so would suit a little smaller. In good condition. Vintage Jaeger Navy Blue skirt, side pockets, lined, 100% wool. Back zip. Vintage 70s skirt Jaeger Pencil wool blend Green check Midi High Waist 8 10 W25"
The skirt is lined, is flat at the front and has a double vent at the centre back. It fastens with a concealed side zip which is topped by a single button fastening on the waistband. Would look amazing with a slouchy jumper and ankle boots. Fixed waist with side zip and button. Non stretch. Era - 1970s. Material - Polyester. Colour - Blue. FABULOUS BUBBLEGUM PINK FLORAL POLYESTER SKIRT WITH SIDE BUTTON AND ZIP FASTENING AND FIXED WAIST. 100% POLYESTER - SKIRT IS UNLINED. It is full length and you can wear it dressed up or down and it also has a sort of faux tie which hangs down one side. It is lined and in very good condition.